Content. Overload. We’re there. The data speaks for itself and the numbers will only increase. The quantity of content being created on a daily basis is mind-numbing. 684,478 Facebook shares. 571 new websites created. Over 100,000 tweets. 3,600 new Instagram photos. 347 new blog posts on WordPress. All taking place within a minute each day. For brands, the challenge of the past has been focused on quantity. Who is going to write the posts to sustain the company blog? Who is going to generate content for your social channels? Times have changed. Brands are on board with the importance of content marketing and its critical role in brand building as well as lead generation. And while quantity will always play a role in content marketing (namely to properly test and iterate), the ultimate focus for brands today needs to be on generating quality content. Last month, Velocity Partners created an excellent presentation called “Crap. The Content Marketing Deluge.” While the team framed this up for B2B companies, the learnings are applicable across all companies and orgs that are investing in content marketing. 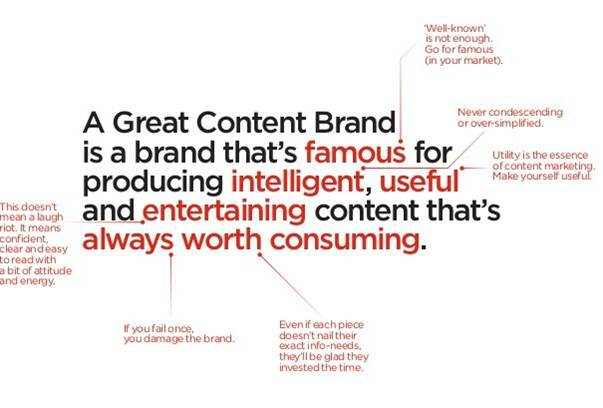 A highlight in the deck is a slide that breaks down what exactly it means to be a Great Content Brand. Print this out. Pin it to your team members’ walls. Stare it every time you get ready to draft a strategy, plan a blog post series, craft a Facebook status update or create any single piece of content. As the deck author notes, you know when you’re being lazy and creating “O.K” content. Don’t be lazy. Don’t create crap content.